A story of the world on the brink of war, Torment straddles the domains of angels and mortals and many other creatures in between such as demons, outcasts, and Nephilim. Nephilim are the offspring of angels and mortals, and they are also those with whom the Angel Daniel has chosen to hide his mortal love, Luce. Tucked away at a school on the California coastline, Luce awaits Daniel's return while searching for meaning in her own past and the supposedly ordinary life she once lived. As her education continues into things beyond her mortal world, Luce finds that perhaps she is not so normal at all. 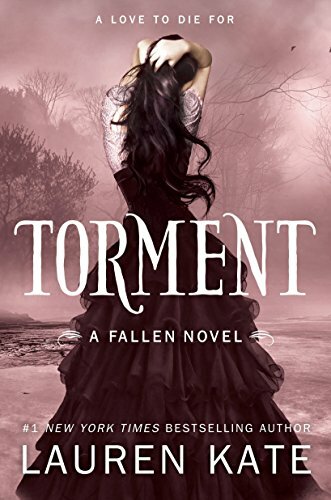 Unlike Fallen, Torment allows readers much more insight into the humanity behind the original equation set forth by Daniel and Luce’s relationship. Doomed to fall for Daniel again and again through each life, Luce never lives past the age of seventeen. At that age, she kisses Daniel, thereby ending her mortal life—until her next reincarnation in which she will remember virtually nothing. But each time Luce reincarnates, she begins to wonder about her human side—and everything that comes with being human, such as family and daily interaction and all that comprises human-to-human quotidian life. While Luce does not know what falling for Daniel will mean each time, he does. He knows that by being with her he is in fact ending her life as she knows it. And yet he still chooses to do so. While her feelings for Daniel still feel monumental and all-encompassing, Luce does find herself wondering if Daniel really cares for her as she truly is: just another mortal girl. If so, why sacrifice her mortal life? Doubts boil to the surface, while the idea of a normal (mortal to mortal) relationship begins to look attractive as Luce gains increasingly more insight into her past lives through what she once called “shadows,” but now knows as Announcers. Then a truce comes to an end. A war of epic proportions seems imminent. Everyone must choose a side. What side will Luce choose? And will it be the same one that Daniel chooses? This second offering in the Fallen series is even stronger than the first. It delves into Luce’s emotional complexity and the questions that are introduced by the first book. Torment is a work of much more maturity and less action, but one that leaves readers satisfied in a different way—and eagerly awaiting the next installment.